I loved boardgames as a child, and still find the time to play one with the mrs every now and then. Last edited by samhain81 on Wed May 30, 2012 12:02 pm, edited 1 time in total. Settlers of Catan. It's quite complex, but just about stops short of falling into the pit of hideously nerdy D&D type censored. Mainly just Scrabble with the odd game of Monopoly & Game of Life every now & then. Can't beat a good game of Guess Who. We used to play a fair bit of Monopoly in the 80's. I've played the new one recently with the credit cards, it's still good, but not the same as the old style one. They've changed some of the place names too haven't they? My brother and I had an awsome version of Battleship that had a small display and explosion sounds. Funny how you can't get this one in the 21st Century! I also remember another Monopoly type game by MB called 'Hotel'. We used to play this quite often at our caravan in Wales. My brother couldn't get into Risk, but me and my mate Dave played the crap out of it when we were teenagers. Boggle. Its compact, takes no setting up, rules are simple and games short. If you can read, you can play. You can even play yourself for high scores. 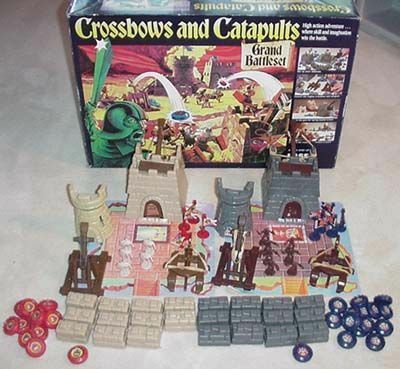 Love Crossbows & Catapults - I took my set into school to play with in the sixth form common room, fun times! Haven't got the box anymore but still got all the other bits. I remember now that used to have both the Dinasaur game and the Crossbows game too, good times. TwoHeadedBoy wrote: Love Crossbows & Catapults - I took my set into school to play with in the sixth form common room, fun times! Haven't got the box anymore but still got all the other bits. Yep, 'Settlers of Catan' is a great game I was introduced to recently. Also 'Ticket to Ride' and 'Formula D'. 'Formula D' is a great one based on motor racing where you have different coloured die to throw depending on what gear the car is in, and you can only change up or down once per turn. Rather cleverly the bigger numbers on the higher dice mean you're likely to overshoot the corners if you're in too high a gear. 'Avé Ceasar' is a similar one based on chariot racing, where instead of rolling a die to move, you hold 3 cards with random movement distances on them, and you choose which to play each time to try to move ahead and block your opponents on narrow sections of the course. Back as kids, two stand out. One was a 'Jurassic Park' themed game that looked a lot like that Dinosaur game - you moved your player, then rolled a die that let you move the dinosaurs to block your opponent. And there were extra cards you could play for extra moves. The other was a monopoly-like game endorsed by John Deere called simply 'The Farming Game'. Instead of property, you bought, bred and sold animal cards to raise money to buy six key 'status' cards for your farm (tractor, farmhouse, etc.) and win the game. Unlike Monopoly, it was actually quite fun and possible to finish.